RED BANK – The first New Jersey based Little Free Pantry was recently constructed and registered at the United Methodist Church in Red Bank. Perhaps you have heard of the Little Free Library movement, enclosed bookshelves in public places where people can give or get a book for free. The “Little Free Pantry” adapts that concept to help meet the needs of those experiencing food insecurity in local communities. 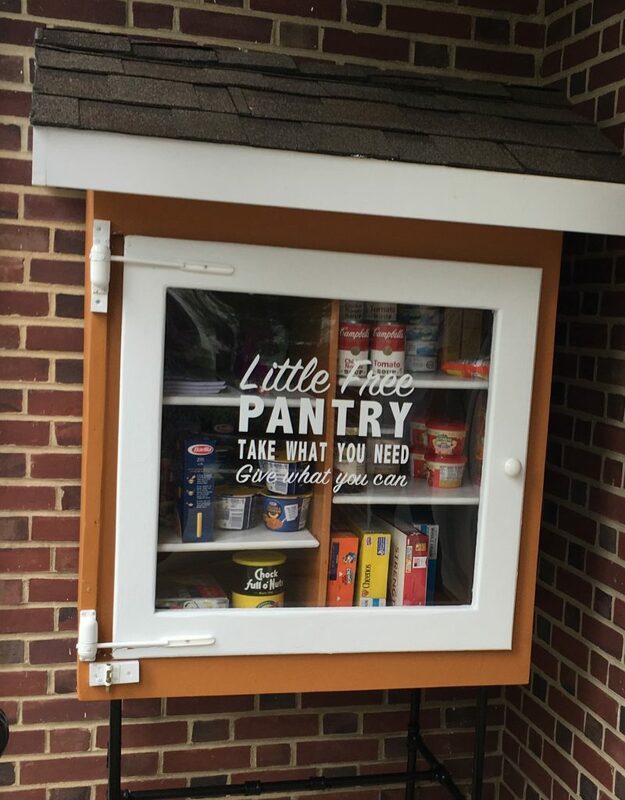 Suzanne Dice, a member of the UMC in Red Bank, dreamed of this pantry for a number of years. While there are numerous local food programs available, they are not always open. “Hunger has no schedule,” Dice noted. So when Raphael (Raef) Kon asked if there was a project he could work on for his Eagle Scout badge, Dice enthusiastically suggested the Little Free Pantry. Kon was introduced to the church’s hunger related ministries when his Troop 246 led two food drives for the UMC of Red Bank’s Backpack Crew. A 15-year-old sophomore at Middletown South High School and faithful parishioner of Saint Mary, Mother of God Roman Catholic Church, he has been in Scouts since first grade. Because only 2% of Boy Scouts attain the rank of Eagle Scout and most do not attain it until they are 18, Kon’s family is proud that he is earning this honor at such a young age. His mother, Theresa, says that Raef was significantly affected by the loss experienced in nearby towns after Hurricane Sandy damaged the area in 2012. He baked brownies and delivered food, blankets, hats, and gloves to Union Beach and Keansburg several times following the storm. Last year when he was considering his Eagle Project, he wanted to help children who had been affected by Hurricane Sandy. Knowing that the UMC of Red Bank Backpack Crew ministry was started to help children in the aftermath of the storm, Kon and his family sat down with Dice and made a plan to begin construction of the Little Food Pantry. The Pantry, a house shaped enclosed shelving unit with a door covered in Plexiglas, was completed and stocked in August. After being placed in the church parking lot, people in the community immediately began using the resource. Dice reports that as word gets out she sees items rotating with people taking what they need and others replenishing with new items. The Little Free Pantry is open to anyone and the anonymous nature of the service helps maintain the dignity of those who need it. Because the church is used by multiple organizations including pre-schools and addiction recovery groups, Dice hopes that the word will begin to get out into the town. In addition to non-perishable food items, the shelves are stocked with school supplies and toiletries. As the weather gets colder, Dice is considering other items like socks, hats, and gloves. Kon and his troop recently completed a third food drive for the UMC of Red Bank. He is glad that the Little Free Pantry is being used and does what he can to make sure it is stocked with food, toothpaste, and soap. While she doesn’t know where the construction of the Little Food Pantry might lead, she plans to begin conversations in the community to establish them throughout Red Bank.